Train mining equipment operators with Cat® Simulators Electric Rope Shovel. Provide an easy-to-use, cost-effective and reliable training method before operators train on the actual shovel. Realistic controls combined with a virtual mine site create a safe and controlled place for operators to experience training exercises such as Controls Familiarization, Shovel Positioning, Following Grade, Cab Side Dumping, Blind Side Dumping, Single Pass Digging, Cab Side Loading and Blind Side Loading. Plus, record and report each simulator session so operators, instructors and administrators can see the results. Make Cat Simulators a part of your training program today and watch production rise! 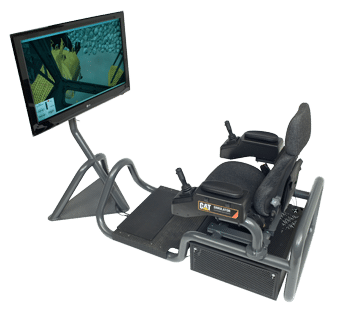 Hardware – Frame and controls needed to operate the simulator, computer, mouse, keyboard, component box, seat,1 monitor stand and one 43″ monitor. Software – Rope Shovel Simulator software and SimU Campus Training Records Management software. Languages supported in the software include English, French and Spanish.